The objective of this course is to provide Guidelines , Give sound knowledge, comprehensive understanding, Committed professional skill , jobs standards and best practices of Occupational Health , Safety and environment Issues to delegate/ participant for implementation HSE plan effectively. Professionally acknowledge leadership skills to develop desired HSE culture in existing working environment to achieve the level of professional business satisfaction pro actively as under. Occupational Health Safety and Environment issues can be look after in an organization. 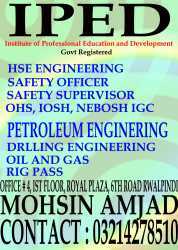 International safety training Courses, IPED, Provides,Nebosh IGC Training Safety, Officer, HSE, Training, Courses, OSHA, IOSH, NEBOSH, HSW, IGC, Oil and Gas, Rig, Safety,Construction, Diploma, International,Certification, Technical, Training, Computer, Courses, safety ,Course, Nebosh, IGC, in Rwp,Islamabad,Pakistan, OSHA, Course, in Pakistan, OSHA in Pakistan, IOSH Course, IOSH Management Safety,HSE ,Course, HSE, Course in Rawalpindi,Islamabad,Pk Nebosh 5 Courses,Nebosh Health and Safety at work.Nebosh (IGC)International General Certification,Nebosh (ICC)International Construction Certification, Nebosh (IOG)International Oil and Gas.